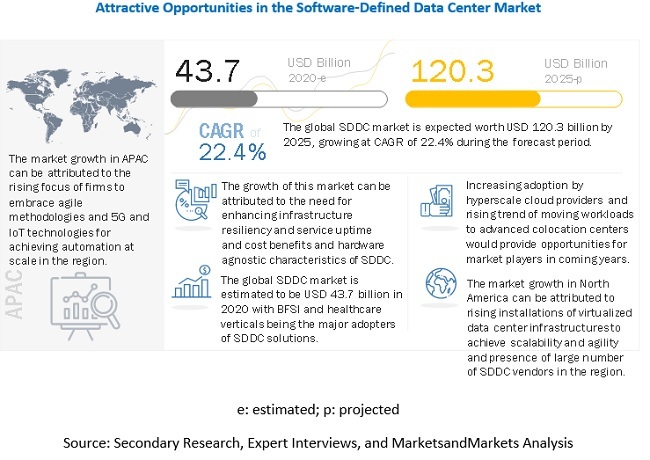 [128 Pages Report] The global Software-Defined Data Center market size is expected to grow from USD 33.5 billion in 2018 to USD 96.5 billion by 2023, at a Compound Annual Growth Rate (CAGR) of 23.6% during the forecast period. Increased uptime and reduced operational expenditure in enterprises fuel the growth of SDDC market. The Software-Defined Network (SDN) segment is expected to grow at the highest CAGR during the forecast period. SDN offers a cost-effective alternative with greater control when compared to traditional networking. This alternative enables centralized controlling of the network traffic without configuring the settings of individual switches. SDN facilitates the provision of dynamic, cost-effective, manageable, and adaptable solutions, making it an ideal solution for dynamic applications by utilizing high-bandwidth. SDN aids end users in managing the highest degree of change necessary on the network to support virtual workloads, thus reducing the complexity of the network in the data center and enabling automation and orchestration of network configurations. This aid is expected to positively impact the growth of the market during the forecast period. The market for Small and Medium-sized Enterprises (SMEs) is expected to gain traction owing to the increasing adoption of SDDC for simplifying and automating SDDC component management. SMEs face 3 critical challenges, namely, capital, skills, and scalability. To overcome these issues, SMEs adopt the pay-as-you-grow model, which offers the flexibility to manage the IT infrastructure as per their requirement. Moreover, SMEs face intense competition from large enterprises; thus, to gain a competitive edge, SMEs are adopting SDDC, which aids in enhancing the overall business productivity. This trend is expected to continue among SMEs during the forecast period owing to the numerous benefits, such as scalability and cost-efficiency, offered by SDDC solutions. Countries such as China, Japan, Australia, India, and Singapore are expected to contribute a significant market share in the Software-Defined Data Center market in the Asia Pacific (APAC). Rising awareness of data management through a common interface at reduced Total Cost of Ownership (TCO), growing focus on server virtualization, and the popularity of using infrastructure-as-a-service solutions are the major growth drivers for the market in APAC. 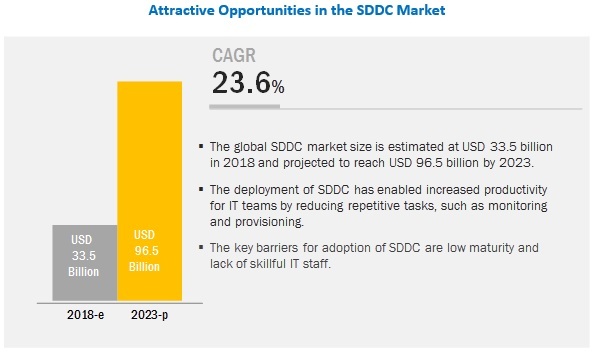 China, Japan, and India have significant potential for global SDDC vendors because of the significant proportion of end user verticals and favorable economic conditions. The APAC market is still at its nascent stage; however, rising organizational needs and the growing popularity of workstation flexibility are expected to drive the market at a significant rate among most of the developing countries across APAC. Major vendors in the global Software-Defined Data Center market include VMware (US), Microsoft (US), HPE (US), Nutanix (US), Dell EMC (US), Huawei (China), Cisco (US), IBM (US), NEC (Japan), RedHat (US), Oracle (US), SUSE (Germany), Fujitsu (Japan), Citrix (US), and Lenovo (Hong Kong). VMware is a leading player in the market. The company was the first to provide SDDC solutions, wherein data center infrastructure was virtualized and provided as a service. The company has developed a broad set of infrastructure service capabilities across compute, storage, and networking. VMware has devised its growth in the global market using organic and inorganic growth strategies. In April 2018, VMware announced the release of its 2 main SDDC products, namely, VMware vSphere and VMware vSAN. The new releases enable enterprises to securely run their business-critical and modern applications in data centers, at the edge, in the public cloud, or hybrid cloud environments. In May 2018, Microsoft partnered with HPE to integrate Microsoft Hyper-V with HPE SimpliVity 380 to offer extended Hypervisor options and high-performance virtual applications to provide VM-centric management and mobility, data protection, data efficiency, and simplified data center infrastructure to both enterprises’ customers. In January 2017, HPE acquired SimpliVity, a leading provider of software-defined, hyper-converged infrastructure. With the acquisition, HPE could deliver the most complete, built-for-enterprise, hyper-converged infrastructure offerings for its customers. What are the upcoming verticals for the Software-Defined Data Center market? The study involved 4 major activities to estimate the current market size of the Software-Defined Data Center market. Exhaustive secondary research was done to collect information on the market, the peer market, and the parent market. The next step was to validate these findings, assumptions, and sizing with industry experts across the value chain through primary research. Both top-down and bottom-up approaches were employed to estimate the complete market size. After that, the market breakup and data triangulation procedures were used to estimate the market size of the segments and sub-segments. In the secondary research process, various secondary sources were referred to, for identifying and collecting information for this study. The secondary sources included annual reports, press releases, and investor presentations of companies; whitepapers, such as Cisco Global Cloud Index; certified publications; and articles from recognized associations, including data center knowledge and government publishing sources. Secondary sources considered for the study include Factiva and D&B Hoovers. Secondary research was mainly used to obtain the key information about the industry’s value chain, the total pool of key players, market classification and segmentation as per the industry trends to the bottom-most level, regional markets, and key developments from both market and technology-oriented perspectives. In the primary research process, various primary sources from both the supply and demand sides were interviewed to obtain qualitative and quantitative information for this report. Primary sources from the supply side included industry experts, such as Chief Executive Officers (CEOs), Vice Presidents (VPs), marketing directors, technology and innovation directors, and related key executives from various key companies and organizations providing SDDC software and hardware. The primary sources from the demand side included end users of SDDC, including Chief Information Officers (CIOs), Information Technology (IT) technicians and technologists, and IT managers at public and investor-owned utilities. After arriving at the overall market size—by using the market size estimation processes as explained above—the market was split into several segments and sub-segments. To complete the overall market engineering process and arrive at the exact statistics of each market segment and sub-segment, data triangulation and market breakup procedures were employed, wherever applicable. The data was triangulated by studying several factors and trends from both the demand and supply sides in the market. VMware (US), Microsoft (US), HPE (US), Nutanix (US), Dell EMC (US), Huawei (China), Cisco (US), IBM (US), NEC (Japan), RedHat (US), Oracle (US), SUSE (Germany), Fujitsu (Japan), Citrix (US), and Lenovo (Hong Kong).